The female hyena, Chipa, was born in captivity in South Africa in 2002. 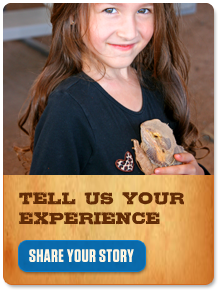 She came to Out of Africa Wildlife Park at just 4 months of age. Chitabe, the male, was also born in captivity in South Africa in 1998. He arrived at the park when he was only 2 months old. They both love to play in the water and go swimming in the pool at the Tiger Splash™ Arena, and they’re often featured in the Wonders of Wildlife show. Besides swimming, they love stinky things and chasing children around the perimeter of their habitat. Chitabe is quite fond of carrying sticks as well. Unlike the negative Hollywood stereotype, Hyenas are quite intelligent and affectionate, and that affection extends to the caretakers who always make time to shower Chipa and Chitabe with their own affection and a good scratch or two, of course. The spotted hyena, also known as the laughing hyena or tiger wolf, is native to Sub-Saharan Africa. This interesting carnivore is found living in savannas, semiarid regions, scrublands and, in some cases, in mountainous areas up to 13,000 feet in altitude. The hyena is scarce or absent in tropical rainforests and coastal areas. Hyenas weigh 90 to 170 pounds. They measure 37 to 59 inches in length, with a shoulder height of 29½ to 33 inches. The female spotted hyena is considerably larger than the male; otherwise they look the same. The large jaw muscles and a special vaulting to protect the skull against large forces combine to give the spotted hyena the strongest bite of any mammal, 40% stronger than that of a leopard. The spotted hyena has a proportionately large heart, constituting close to 1% of its body weight, thus giving it great endurance in long chases. Its front legs are longer than its back legs, giving the animal a hunched look. The spotted hyena is a non-seasonal breeder, though a birth peak does occur during the wet season. Females are polyestrous, with an estrus period lasting two weeks. The gestation period tends to vary greatly, though 110 days is average. The average litter consists of 2 cubs. Cubs are born with soft, brownish black hair and weigh 2 pounds on average. Unique among carnivorous mammals, spotted hyenas are born with their eyes open. Cubs nurse for 12 to 16 months, though they can process solid food as early as three months. Within ten days of birth, they are able to move at considerable speed. They begin to exhibit hunting behaviors at 8 months and will begin fully participating in group hunts after their first year. Spotted hyenas reach sexual maturity at the age of three years. Hyenas live up to 20 years in the wild and up to 40 years in captivity. The spotted hyena is a social animal that lives in large communities called “clans,” which may consist of between 50 and 100 individuals. Females dominate males, with even the lowest ranking females being dominant over the highest ranking males. Spotted hyenas live in a “fission-fusion” society, so clan members do not remain together continuously, but instead frequently forage alone or in small groups. Home ranges are defended through vocal displays, scent marking, and boundary patrols. Overall, spotted hyena society is characterized by its flexible nature, as demonstrated by impressive variation in group size, territorial behavior, foraging tactics, and nursing behavior. The spotted hyena travels long distances in search of prey. The spotted hyena primarily kills and scavenges mammalian herbivores. These include small, medium, and large-sized antelope, Cape buffalo, and other herbivores such as zebra, warthog, and the young of giraffe, hippopotamus and rhinoceros. Hyenas can be very opportunistic and have been recorded eating almost any mammal, bird, fish or reptile, irrespective of size. The spotted hyena detects live prey by sight, hearing, and smell. It detects carrion by smell, the noise of other predators feeding on the carcass, or during daytime, by watching vultures descend on a carcass. Its hearing is acute enough to pick up noises over distances of up to 6 miles. A single spotted hyena can eat up to 32 pounds of meat per meal. Most people think hyenas are scavengers only. Spotted hyenas do scavenge during the day, but roughly 95% of their food is from their own kill. In fact, lions will readily appropriate the kills of spotted hyenas. Spotted hyenas can trot at 6 miles per hour without getting tired for long distances. They can run up to 30 miles per hour and make good swimmers. Cubs will attack each other shortly after birth. This neonatal siblicide kills an estimated 25% of all hyenas in their first month. They are one of the most vocal mammals in Africa, with over 11 different sounds recorded by researchers. The famous chatter they produce actually sounds like a human laughing hysterically. This “laugh” is used during times of nervous excitement or submission to a dominant hyena and should not be mistaken as a playful sound. A single hyena can take less than 2 minutes to eat a gazelle fawn, while a group of 35 hyenas can completely consume an adult zebra in 36 minutes. Hyenas can eat one-third their body weight at one meal. Spotted hyenas can digest things that most other animals cannot, like skin and bone. Special acids in their stomach break down these rare delicacies. Hyena fossils have been found in North America, Europe, Asia, and Africa, but hyenas have only lived in Africa for the last 5,000 years. 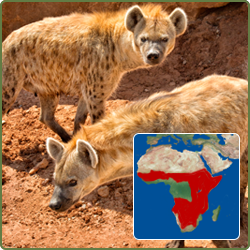 Spotted hyenas play a major role in Africa. They help control populations of a wide variety of species, and, because they’ll eat almost anything, they clean up everything in their path. While spotted hyenas are not threatened at the moment, things could change. Drought can have drastic effects on the food chain, from herbivores to carnivores. The total world population size of the spotted hyena is well above 10,000 individuals. The rapid decline of populations outside conservation areas due to persecution and habitat loss makes the species increasingly dependent on the continued existence of protected areas. Their current conservation status is classified as lower risk.